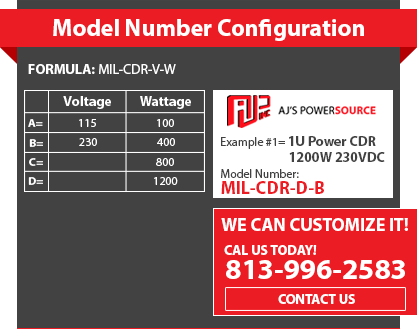 AJ’s Power Source Inc. is pleased to announce the release of our new MIL-CDR SeriesTM. This new series is a Ruggedized Military compliant power conditioning system built for deployment and11 operations equipment. These units are available to all the Military Industry, homeland security and government contractors. Built for a Very Low EMI signature and very High Reliability this power system will keep your product up and running for many years to come. The MIL-CDR SeriesTM is a 1U power conditioning system that provides up to 800 Watts at 115 VAC 60Hz. This is a fully isolated in line double conversion system with input surge protection. The Military Ruggedized Universal Input Tactical Power Conditioner Has Unique Features Designed to Meet All the Military Standards. AJPS’s has been supplying high end Military Power Conditioner Solutions to the Navy, Air Force, Army, Marines, Special Forces and Coast Guard for over 20 years. All of AJPS’s operations are monitored and controlled by an ISO 9001:2000 based quality systems. To learn more about our custom capabilities please, Contact us online or call our main office at (813) 996-2583 our experienced Representatives will provide you a custom Quote for your custom power requirements.